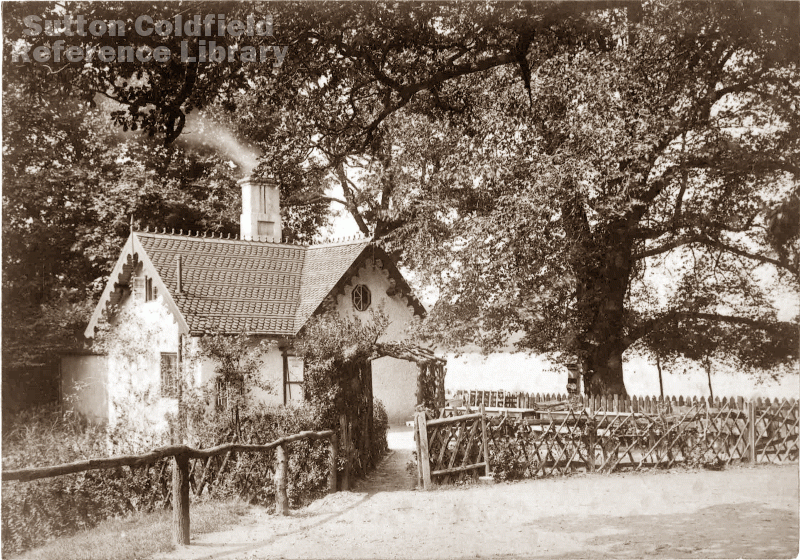 Bracebridge Pool in Sutton Park has changed in appearance over the years. 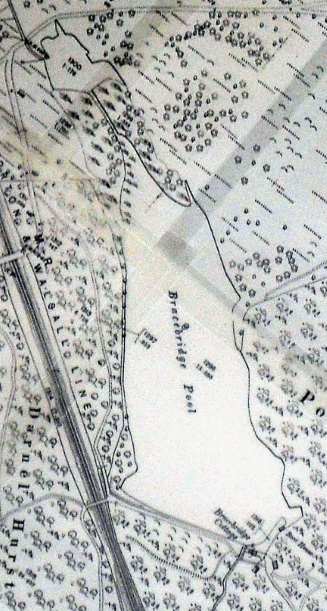 Early maps show that the pool extended to include Little Bracebridge Pool, which is now separated from the main pool by a stretch of swampy ground. One possiblity is that Little Bracebridge is the remains of a large peat pit (peat was dug to be used as fuel in the Middle Ages), and that it pre-dates the larger pool believed to have been the creation of Sir Ralph Bracebridge, who was the tenant of the Manor House and Park of Sutton in 1419. Sir Ralph’s pool is thought to have been made to supply the heavy demand for fish, especially bream. Little Bracebridge could have been used to bring on the small fry before being released into the main pool; when mature the fish were transferred to clean water in fish stews below the dam to lose their earthy taste before being served up for a Lenten feast. Two centuries later fashions had changed and the fishery had been abandoned, but the pool was put to another use. In 1594 the Sutton Corporation made a grant to John Barlow of Sutton Coldfield, allowing him to alter Bracebridge Pool and build a watermill there either for fulling cloth or for making blades. The alterations to the pool would have entailed raising the height of the dam to give a greater fall of water to power the waterwheel as well as creating a much larger reservoir to secure availability of water when required. This higher dam would doubtless have flooded the swampy ground between the main pool and Little Bracebridge, forming a single sheet of water. The mill was soon abandoned, and the pool was left in peace until 1757, when it was leased in perpetuity to Simon Luttrell and his successors at Four Oaks Hall. Bracebridge Pool was an important addition to Luttrell’s estate, which already included a large park, and the value of the pool was for sport -fishing and duck-shooting - and pleasure, parties from Four Oaks Hall could go there for picnics and to admire the scenery. To complete the rustic idyll a picturesque cottage was built on the site of the old mill. The 1857 Valuation Map of Sutton shows Bracebridge and Little Bracebridge as a single sheet of water; the overflow stream from Bracebridge Pool leads from the centre of the dam, while another stream from the pool issues from Bracebridge Cottage - presumably the former mill race. Thirty years later, the first edition Ordnance Survey shows the two pools separate as they are today, and the only overflow stream is next to the cottage. The Midland Railway Company was responsible for these changes. The railway line, authorised in 1877, passed close by the pool, and when it was constructed it was found necessary to make some alterations, in consultation with the corporation. The pool was drained and the dam repaired, with a walkway three feet above the level of the old footpath across the dam. The railway company used a great deal of material excavated from its cuttings to raise the level of the walkway, and used the surplus to fill in the swampy valley below the dam where the fish stews had been, leaving only the outlet near the cottage to carry the overflow stream. It may be that the water level in the pool was lowered as a result of this work and the land separating the two pools was once again above water. 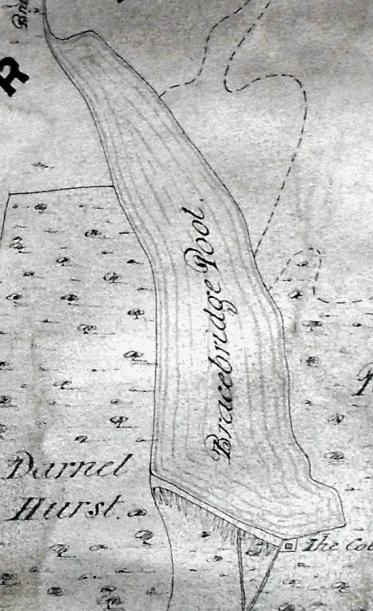 Detail of the 1824 Corn Rent map of 1824 on the left, showing the pool as a single entity, while the 25” OS map on the right, shows Little Bracebridge separated from the main pool, and the small island has appeared.